Every year our school organizes a book dress-up day that is so much fun for kids, but quite a challenge for parents. Last year I made a crayon costume using only felt, scissors and hot glue for my boy and created an Ella Bella Ballerina costume by adding some DIY details to the already owned ballet outfit. This year, my boy chose to dress up as a pigeon from the book, “The Pigeon Wants a Puppy”, and my girl decided to dress up as Winny The Witch, but she chose to use her last year’s Halloween costume. That made my task easier – I had only one suit to create instead of two. It took me half a day to design and sew this simple costume. I bought some white, black and yellow felt for details, but as a primary material, I used soft cotton fabric, because I was sure my super active boy would not survive school day in a bulky costume. I used some ideas from Pinterest and created the end product in my head. That was the first more significant project for my new sewing machine. O boy, it was such a pleasure to work with a powerful helper like this. 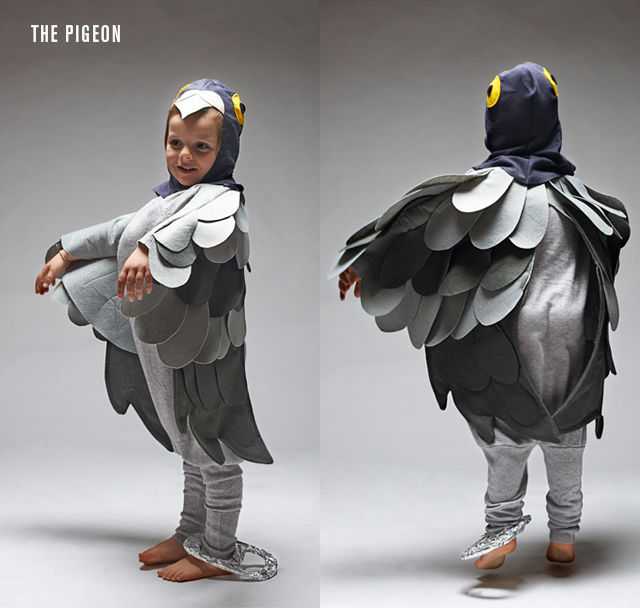 My boy looked so cute as a pigeon. I know it’s easier to buy a fancy costume from the party supplies shop, but these little DIY projects are more satisfying than sacrificing. I saw excitement and sparkle in my boy’s eyes, and it was the best part of my DIY project. Wonderful costume Ausra! You’re a genius!!! Hugs! Do you have the pattern that you created? I just took my kid’s hoody and traced the shape. I used a small plate and a cup for eyes to trace and the body part was just from my head.